Turn over ceremonies of incoming and outgoing managing directors of Norwegian Training Center-Manila (NTCM) was held yesterday July 17, 2012 at the University of Cebu Lapulapu & Mandaue (UCLM) quadrangle. Capt. Stein Eriksen, Outgoing Managing Director of the Norwegian Training Center turned over his office to Capt. Erik Blom, Incoming Managing Director. The Norwegian Shipowners’ Association serves more than 160 companies in the field of Norwegian shipping and offshore contractor activities. Its members employ more than 55,000 seafarers and offshore workers from more than 50 different nations. 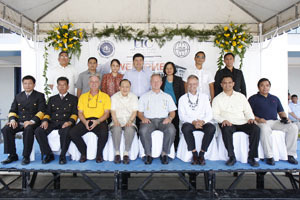 The NSA Philippines Cadet Program of the Association of Shipowners’ Training and Education Project (ASO-ATEP) aims to improve the maritime education in the Philippines. Of the total population of seafarers worldwide, thirty-five to forty percent (35% – 40%) are Filipinos. These maritime workers contribute roughly thirty-nine (39%) percent to the economy. 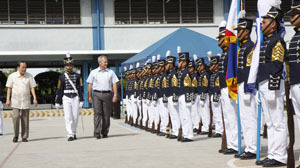 UCLM has its 20th batch of cadets this year, with an average of 300 cadets per batch.